Store-bought ricotta can’t hold a candle to creamy, rich homemade ricotta cheese. This recipe makes the ricotta cheese in an Instant Pot using the yogurt function. The yogurt setting gently heats the milk to the perfect temperature, so there’s no worrying about scorching the milk on the stove. One of the great things about making your own ricotta is that you can decide the texture and consistency you want. For a thicker, drier cheese, go for a longer strain; for a smoother, creamier ricotta, strain for a shorter amount of time. 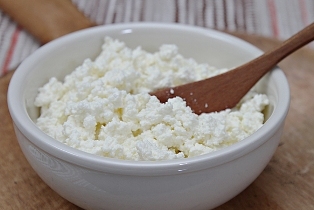 From one gallon of whole milk you will get approximately 15 ounces of ricotta. The only 3 ingredients you will need are whole milk, lemon juice and salt. You can experiment with 2% milk, but you will get more whey and less curds with reduced fat milks. You can also use distilled white vinegar in place of the lemon juice. I've tried both and prefer the taste and consistency I get with lemon juice. Once the cooking cycle is finished (in 20-30 minutes) the display will read "yogt". Remove the lid and with an instant read thermometer, check that the temperature of the milk is 180 degrees F. or very close to it. When time is up, and you aren't at 180, press the "Sauté" button and allow it to cook a little longer. It will reach 180 degrees in a short time. With pot holders, carefully remove the Instant Pot stainless steel insert and put it on a trivet on the counter. Close the lid and position the steam release handle to "Venting." Press the "Yogurt" button until the display says the word "boil". Add the lemon juice and stir gently a few times (overzealous stirring will create cheese with a grainy texture) until you begin to see the milk coagulate. There will be a separation between bright white chunks of curd and thin yellowish liquid whey. This will take about 30 seconds. Stop stirring and let the mixture rest for 10 minutes. Pour the mixture through a yogurt strainer or a fine-mesh strainer lined with cheesecloth (or one of the other options mentioned above) and sprinkle with the salt. 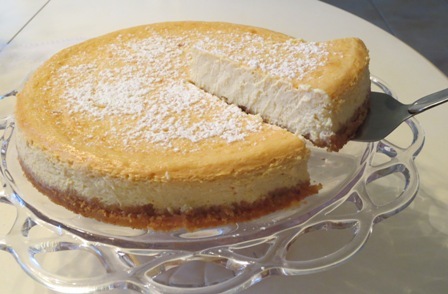 Let the ricotta drain for 20 to 60 minutes depending on how thick you want it. If it becomes too thick, you can stir some of the whey back into the ricotta. When the ricotta is completely drained you can use a spatula to form it into a soft mass and transfer the ricotta into a bowl. It can be used right away or stored in an airtight container in the refrigerator for up to a week. If desired, you can save the strained liquid and use in any recipe in place of stock (for example to make rice) or in place of water for future baking projects. Otherwise, simply discard it. Makes straining the milk for homemade ricotta or Greek yogurt less messy than other methods. It can hold up to 1/2 gallon of milk. The strainer is easy to clean and can be used over and over again as opposed to using cheesecloth. Instant Pot is a smart Electric Pressure Cooker that speeds up cooking by 2~6 times using up to 70% less energy and, above all, produces nutritious healthy food in a convenient and consistent fashion. Instant Pot Duo is a 7-in-1 programmable cooker, it replaces 7 kitchen appliances as it has the functions of a pressure cooker, slow cooker, rice cooker, steamer, sauté, yogurt maker & warmer.